The Chelsea youngster has joined up with the senior squad for the matches against Czech Republic and Montenegro after Luke Shaw's withdrawal, just days after his maiden Under-21 call-up. But Southgate's commitment to blooding young players means his rare Premier League appearances have been deemed irrelevant. "I think a lot has been made of it," ex-England Under-21 international Rosenior said on The Debate. "You need to look at the player and his characteristics. When he has performed for Chelsea he has performed at a level which is at international level. "Sometimes I felt it was too long for players to get a chance with England. What I love about what we're doing now is we're giving young players a chance to give them a chance to say 'I am good enough'." 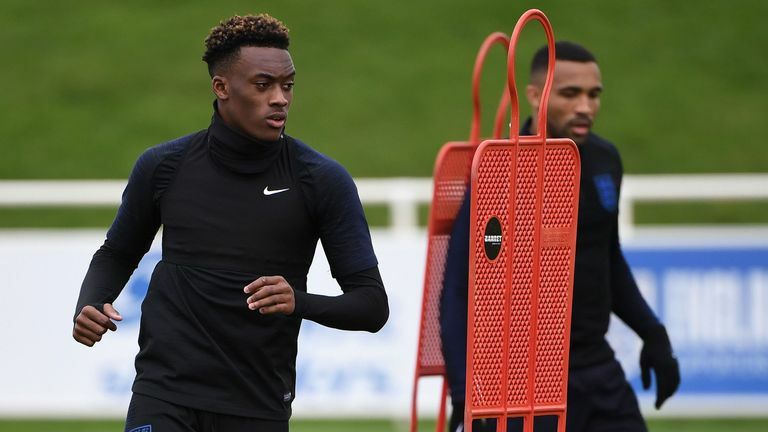 The call-up comes while Hudson-Odoi's future at Stamford Bridge is increasingly uncertain. Chelsea turned down multiple bids for the forward from Bayern Munich during the January transfer window, amid the failure to agree an extension to his contract which expires in 2020. Gareth Southgate watched Bournemouth beat Huddersfield on Saturday, but will any of the players make his March internationals squad? But the interest from the Bundesliga champions merely confirms Hudson-Odoi's burgeoning talent, says former England international Kevin Phillips. "Bayern Munich don't offer £35m for nobody; they've done their research, they've done their homework," said the 45-year-old, who played eight times for England. "He is a top talent. Why not get him in the squad now? Get him prepared for our next major tournament. "I am excited about it. He hasn't had a lot of football this season but when he has played he looks like an exciting talent. He is certainly a player for the future but as Gareth has shown the future is now. "Just being around these top quality players, getting the experience he has. He is an exciting prospect and I don't think we're blessed with too many of those in our country. I am really looking forward to seeing him perform."